Love those coats, all the photos are beautiful! Agreed! Love a great peacoat for winter. with all the huss fuss with Billy Reid’s peacoat. i thought it would’ve been on here. anyone know the coat the woman is wearing in the top right? My mom bought me the pea coat you see on me (top right) from J. Crew when I was in high school (pre-2006). I still have it and wear it every season. nothing a good peacoat can’t fix. Men in peacoats is my kryptonite. The boy top left has such a beautiful smile! This coat is a classic. I always was and will be a big lover of those jackets. The guy with the beard an the right looks fantastic, uhh so chic. I really like that type of coat. so nice style. Have a nice day. 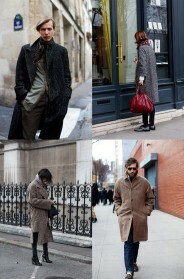 they all look so sharp, peacoats are a must have. To me a peacoat is almost the only piece you can wear putting up the collar without looking (or feeling) overambitious. I love this kind of coat! And I like the first girl’s style. I like this style on her and him!! Love the bottom middle. Such a cutie! I love the combination white pants and peacoat. I love Peacoats! and that first guy is soo cute!! This is a “must have” classic piece of clothing in a wardrobe. I’m looking forward to getting one. Not sure if I can pull it off. Sublime examples. Personally, I’m loyal to my 31 year old army jacket. I like my Pea coat, but I’m tired of the navy blue. I’d love to see them come in brighter colors. No matter what the fashion designers do, they will never capture the edge and style of a real USN vintage issue peacoat. Oh!! so trendy! and also super feminine as the one worn last week by the preppy Pixie Lott!!! don’t you agree?! Peacoat is all time classics. I love peacoats! They are the poop for sure!! I am always thinking about pea coats. Love Autumn/Winter dressing. “If you’re thinking about peacoats… I got your back” Ugh, Scott I like to think that you always have my back. LOve this kind of coat, my sister has one and I steal it every time I can! The folks in these photos all look great, but for myself… eh. I think I’m one of the 6 people on the planet who really doesn’t look good–at all–in a peacoat. The guy on the far right in the bottom row has lots of style! Hmm, now I’m thinking about it :) Love the second one! Love, love peacot!!!! The blue peacot with gold bottons is absolutely my favourite, kind of sailor style!! I got an old one of Brooks Brothers ..
Pea Coats will always have a place in my heart. love peatcoats!!! !The blue with gold bottoms seems like my but whit the exception that mine is black!!!! I do love a peacoat…in fact I had one well-loved one during junior high. I wore it so much that it got threadbare spots on it. Today, I’d wear it with a punchy red scarf and maybe a matching handknit beret. Peacoats, at least the traditional navy ones, really do beg for something red. Even plaid. Congratulation’s each one of them has style from head to toe and a great feeling for colors. Does anyone know the brand of the coat of the man on the top left? 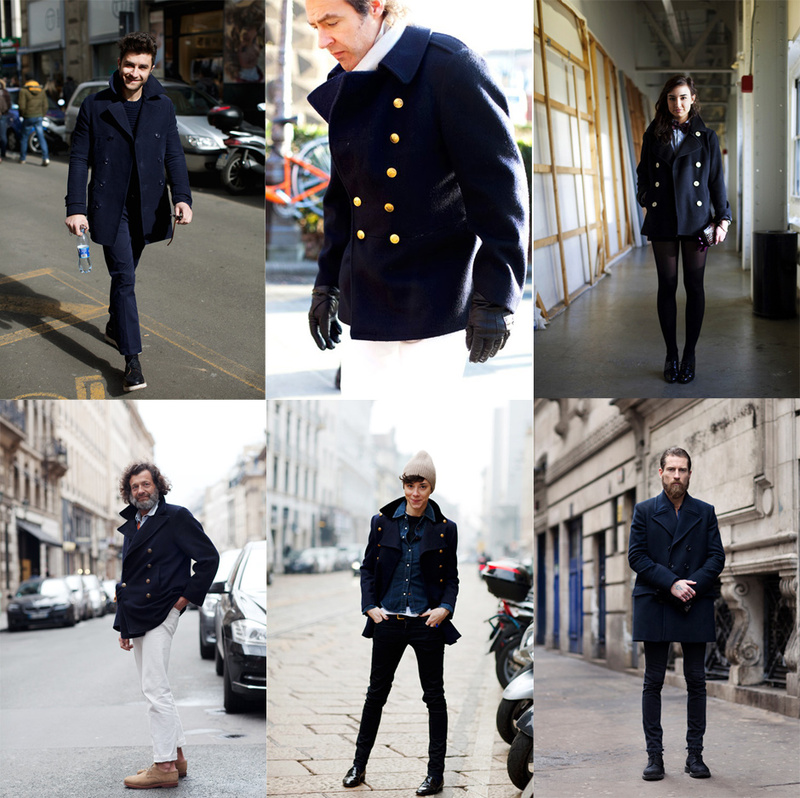 Pea coat is already approved in the course of almost 300 years. Do not doubt that is the real classic. Justin O’Shea is so stylish!!! I need to get one!! I like them so much, most of all for men. Great look bottom centre – love the layering and the boyish charm to the outfit. Is John Cusack in the top center?? Who is the gentleman in the lower right hand corner? Thanks! All the style and color make anyone more glamorous. Thank you for sharing great look mens peacoat .